We varied from the tried and efficient DC Metro and ended up attempting the shuttle bus on this visit to DC. I used to live in Crystal City, so taking the Metro from Washington Reagan Airport one stop to Crystal City is something we have done before. Mik's new wheelchair does not allow for pushing him and having any bag on the back, though, so going on the Metro with luggage did not seem as easy. Not to mention the front wheels are so hard to tip up for the boarding and unloading (they also get stuck easier than old chair, hence have to tilt them up for bumps the old chair's front wheels would have gone over) and do not need any extra weight on it to make it harder. 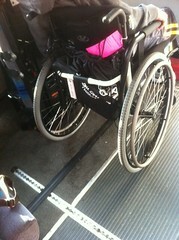 Anyways, the Hyatt said they had a wheelchair accessible shuttle. We just had to call and request it when we arrived. Well, the shuttle definitely does have a lift, but it was not a good experience at all. First, off the lift ramp flap did not come down all the way and the driver was telling us to go on oblivious to it not being already down all the way. I noticed, though, and he pushed it down. Once on board we were standing just inside of the lift and he was ready to go. Then he reconsidered and had a passenger move to actually lift up the seat that makes room for the chair to be behind the driver. Then off we went. No tie downs or anything. And this was a shuttle bus that actually had buckles on the regular seats. The ride is not even a mile, but there are a lot of stops and turns in that short distance. Mik hates buses and was freaked out the whole time. Usually he just overreacts, but this time he had a reason to fear, as even though I was holding his chair down at one turn his right wheel actually left the ground. From now on, we are sticking to the Metro or maybe a taxi for the airport. Sure, there are no tie downs on the Metro, but the ride is smooth enough to not be a problem. Only problem we ever run into is elevators being down, but this trip there are very few throughout the system that are out and the one that ended up being where we wanted to get on was only two blocks from the next station.